For the first time, ALL their biggest American hits on one disc! Now one of biggest hits in the history of London's West End, the musical based around Queen's music "WE WILL ROCK YOU", will open at the Paris/Las Vegas. For the first time, a major production is being brought directly to Las Vegas for its' American premiere & it's going to be BIG. Co-Produced by Robert DeNiro & his Tribeca Productions, English comedy legend Ben Elton (THE YOUNG ONES) & Queen. 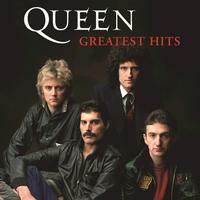 In conjunction with that extravaganza, one of the perennially best-selling rock albums in existence, Queen's GREATEST HITS, is being released in an entirely new version. "We Will Rock You" edition. Remastered by Queen producer/engineer Justin Shirley-Smith! New liner notes by the band! Track by track insights by the people who were at creation! An entirely new package featuring previously unreleased photos by rock legend Mick Rock! The original performances! Includes three bonus tracks: "I'm In Love With My Car" (as heard in the Jaguar campaign, Previously unreleased version), "Under Pressure" (Previously Unreleased - Live from ON FIRE AT THE BOWL), & "Tie Your Mother Down" (Previously Unreleased - Live from ON FIRE AT THE BOWL). Customer Reviews (3.50 Stars) 2 person(s) rated this product. Dynamic range of 8, It looks like the higher frequencies were boosted, and the whole thing up sampled, and over sampled.